You are here: Home > How Can a Universe Begin? How Can a Universe Begin? Of all questions the most fundamental is: What was the initial condition of the universe? It is fundamental for philosophy and religion. It is even more fundamental for physics. Unfortunately it is a realm where physics fears to tread. Yet we may need to tread this realm to find the much-sought Theory of Everything or ToE. Here’s why. The trouble is that physicists hang on to what they know, so neither of the two new theories is really new. They do lead to new versions of old ideas. In particular (no pun intended) they both see spacetime as not continuous but granular. And they both see the smallest bits of space as being Planck-sized. Overall you might say they are new spoons that stir old stews. Neither of these ToE candidates, in other words, gets back to basics. Their central problem is they both begin with background. Background in theoretical physics is anything the theory assumes—like space or time—that forms a kind of stage on which the theory plays. The problem with building theory on a background is the theory ends up being about that background. This is a problem not of physics but of strategy. Any background is toxic for a ToE. American string theorist Lee Smolin has as much as said so. But having come to this conclusion a decade ago (I think it was the right one) even he wimps out. His strategy for dealing with it is to cut back on the background. This may be easier than getting rid of it. But it’s a compromise that isn’t working. The only strategy that can get to a ToE is an approach that has no background, none whatever. In simple terms this means no space, no time, no matter. Smolin said it this way: ‘The fundamental properties of the elementary entities consist entirely in relationships between those elementary entities.’ But even this Spartan rule leaves room for a bit of background. If there are multiple entities, for each one the others form a background. So I take it one step further. No background means only one kind of entity. It is a quantum of space. And there must be only one of them. Like it or not this brings us up against the origin of the universe, before the Big Bang. 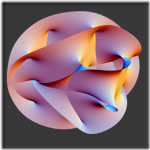 The question Smolin leaves hanging is: What is this entity? My two-bits worth: It is the 6-D Planck-sized Calabi-Yau manifold that forms the basis of so much of string theory. Its volume (the Planck volume) is mind-bendingly small. For convenience I call it a fleck. As we saw two weeks ago, the fleck must serially replicate. If each fleck replicates every Planck time, the universe grows to be larger than all we can see in less than 10-42 second. Serious background! We can escape this background only if we look back to the beginning. What about Smolin’s relationships? This is where the genius of Australian particle physicist Sundance Bilson-Thompson kicks in. He shows how all of the sub-atomic particles that make up matter can be composed of braided twists. He’s twisting what? He doesn’t say. I suggest that it’s the interface or link between a fleck of space and its next neighbor. Twist how? Twist is the perfect fundamental relationship. Stretch a strip of paper between thumb and finger of each hand and rotate one hand through 180 degrees. That’s a Bilson-Thompson twist; he calls it a tweedle. There are just two kinds of tweedle: clockwise (tweedledum) and anti-clockwise (tweedledee). Behind this Carrollian humor, his insight leads us to a simple recipe for a universe. Everything—space, matter and energy—is made of flecks of space and twists between them. Just start with one and none respectively and let flecks replicate. Almost instantly you’ve got a cosmos and it looks like ours. The perception of man is “time restricted”. We are used to the time bounded perception of beginning and end. We should get beyond this and realize that the universe is beyond time. It was, is and will be for ever. We are so intimidated by the concept of time, that we are unable to comprehend timelessness. Everything existing, exists between a beginning and an end, even in the universe. We are making the mistake as to also extend this perception to the Universe which has no limits. Thanks for your comments, with which I am in agreement with the exception of your second-last sentence (beginning, yes; end, I think no). I would be interested in your thoughts on my next post (which is in the hands of my editor and should go online Monday) in which I return to the concept that the universe is 3-D and has no time. The basis for this is set out in Time One. You might be interested particularly in this chapter: http://timeone.ca/chapters/the-end.pdf.